During the Shoeville sales last year, I manage to grab my first pair of sandals just for beach holidays. It was a really nice one, that reminded me of Brazil and the beach sands. Made from real leather straps, my sandals still live on until now! it's already a year since I bought them and through rain, water and sun, the straps did not break. Compared to my pair of "V"brand sandals (don't want to mention the brand") which only lasted a week =_= then straps broke. I guess sandals above rm100 are made to last? (or not, I am just blabbing here). Anyway people who see my sandals kept asking me where I get them from so I'll just say it out here now that I got them from Shoeville and Shoeville will be having their 1st Anniversary too from 1st Sep - 7th Sep, 2011. During this period, Shoeville will be donating 50% of their sales to Malaysia' Breast Cancer Welfare Association in support the pink ribbon campaign. 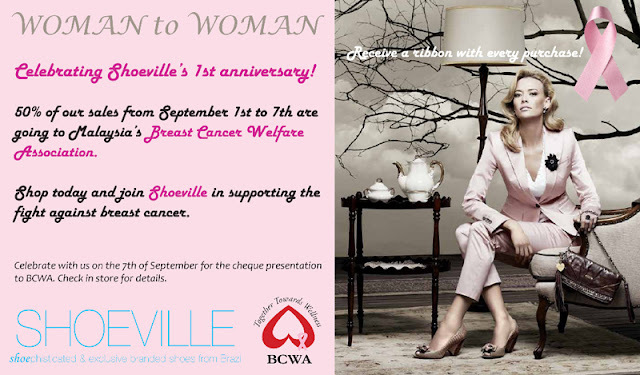 A cheque will be presented to BCWA on 7th September, 2011 at their shop in Bangsar Shopping Center at 7.30pm. RSVP to attend the event from their facebook page here! http://www.facebook.com/event.php?eid=101018756665036.